This is my number one comfort food. As a matter of fact, all hot and spicy food can be my comfort food. But this hot and spicy chicken gets the crown. Chicken thighs are perfect for making this dish. They are tasty and tender, and they don’t easily get dry when frying. My husband is from Sichuan, China. That is a place most famous for hot and spicy food in China. (Yes, they also have panda there too.) 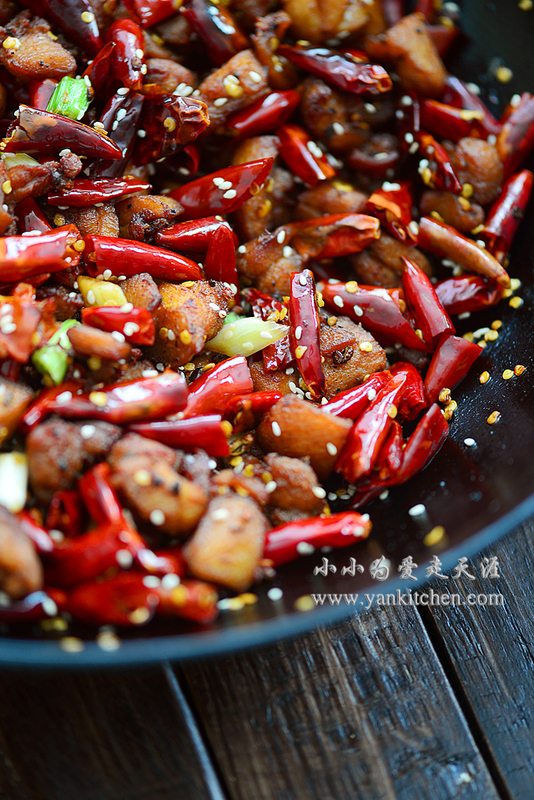 Sichuan pepper corn gets its name because they have the best quality pepper in Sichuan. After living together for a long time, I find myself crazily in love for hot and spicy food too! We both learn to like what the other likes to eat. That is good. Remove the fat, bones and skin from chicken thighs, and cut into half inch cubes. Place chicken in a large bowl, add soy sauce, rice cooking wine, sugar, ginger, salt and black pepper, mix well, cover with plastic wrap and let it rest for at least 30 minutes. Heat a wok filled with oil over high heat. Fry the chicken in several batches until they are golden brown. Drain well. Heat another wok over medium low heat; add oil along with garlic and ginger. When garlic turns slightly golden brown, add Sichuan pepper corns and dry chili peppers. Fry them in oil for 1 minute; add fried chicken; season with salt. Stir fry chicken and pepper over low heat for 4 to 5 minutes. Add sesame seeds and keep stir frying for another couple minutes. Serve immediately. It goes great with icy cold beer!